Bo Jackson - Most knowledgeable athlete ever? Nolan Ryan - Best head-locking pitcher ever? 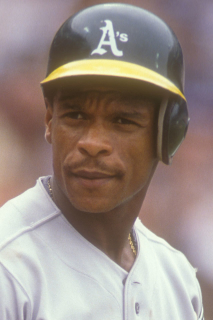 Rickey Henderson - Best third person interview ever? Devon White - To this day, I do not know much about Devon White. I know he played the bulk of his career for the Toronto Blue Jays and California Angels. I also know that his 1991 Upper Deck baseball card is sitting in my box of cards in my closet. Correction - all 35 copies of his 1991 Upper Deck baseball card are sitting in my box of cards in my closet. For some reason, this card could not bear to spend any time away from me and I managed to collect more copies of the same card than one person could possibly need.. 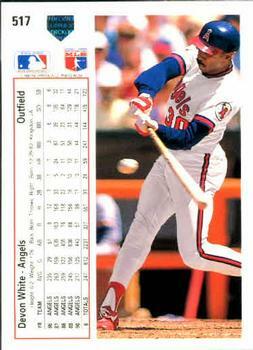 If anyone needs a 1991 Devon White Upper Deck baseball card (currently valued at $0.10), please let me know and we can work out a trade. 9. Ozzie Smith - If my grandfather was reason number one for my love for baseball, my baseball card collection was reason number two. 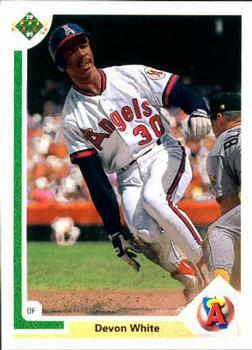 In the 1980's and early 1990's, I hoped for an Ozzie Smith card in every pack I opened. I am sure that I was not alone. Ozzie was called the Wizard for a reason - his defense at shortstop was unmatched. Oh yeah, his name is Oz. BUT HIS DEFENSE!! It was incredible - enough for thirteen straight National League Gold Glove Awards at shortstop, fifteen All Star Game appearances, a Rookie of the Year Award, and six seasons of Most Valuable Player award votes. While the accolades piled up over the years, his achievements were not what got adolescent me excited. When Ozzie came onto the field of play, he did a freaking backflip. Yeah, your defensive wizardry was cool, but that backflip... Check out the video below. He was 40 years old, starting at shortstop for the Cardinals on Opening Day, and he breaks off that beauty. 8. 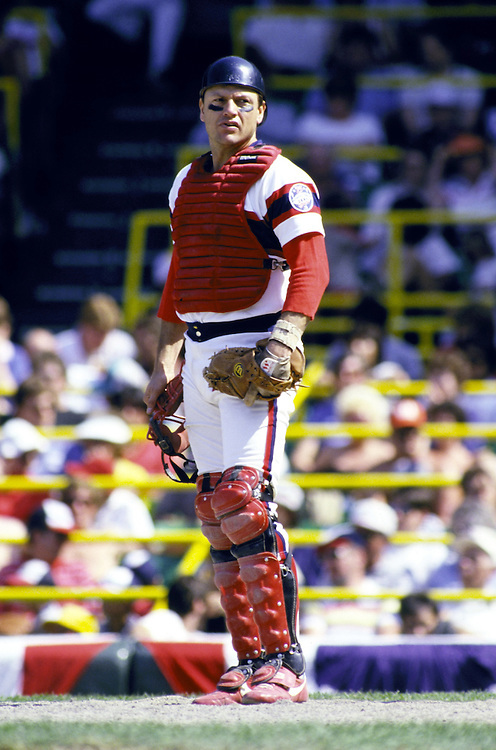 Carlton Fisk - For a brief stint during my elementary and middle school days, I was a Chicago White Sox fan. As a native of Minnesota and a lifelong Twins fan, talking about this dark period in my life is difficult even all these years later. It was a time when I was young, stupid, and impressionable. This random fandom developed out of a gift from my neighbor Ben - a floppy, worn, and totally awesome Black Sox hat. The cream crown with the blue pinstripes, logo, and bill became a permanent fixture on my noggin for several years. Even though this cap no longer fits my giant head, it remains part of my extensive hat collection and I do not foresee it disappearing from my possession anytime soon. As this sad period of my life corresponded with my baseball card phase, I gravitated toward those White Sox players that existed in card form in my binders and boxes. Carlton Fisk appeared in my collection the most and immediately vaulted to my favorite players list. He was a hard-nosed, scrappy fighter playing one of the toughest defensive positions on the field and I loved his swagger. Also, catcher baseball cards tend to be some of the cooler cards as the battle armor makes for a completely different look to the player. His heroic 1975 Game 6 walk-off arm-waving home run for the Boston Red Sox happened prior to my existence, but the aura surrounding that game followed him for the remainder of his career. 6. 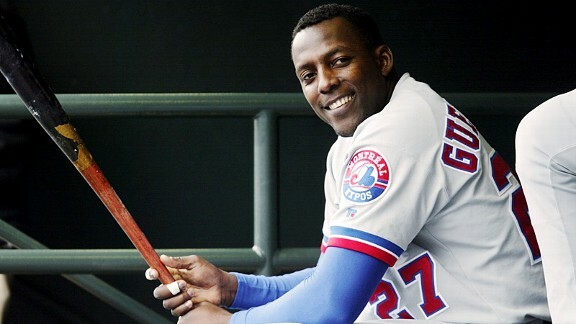 Vladimir Guerrero - As an opposing pitcher, how do you approach a Vlad Guerrero at-bat? As the greatest bad-pitch hitter ever, Vlad would crush balls in the strike zone and he would also crush balls a foot off the plate. His ability to hit any pitch was legendary - in 2009, Vlad swung at, connected with, and singled on a pitch that literally hit the dirt in front of home plate before he got wood on it. Who else can do that? Every Guerrero at-bat was worth watching as you never knew what kind of crazy swing you would see. I also loved watching Guerrero in the outfield. Normally situated in right field, Guerrero was renown for throwing base runners out with his absolute cannon of an arm. In nearly half of his 15 seasons in the big leagues, Vlad had double digit assists from the outfield. Don't ever run on Vladdy. 5. 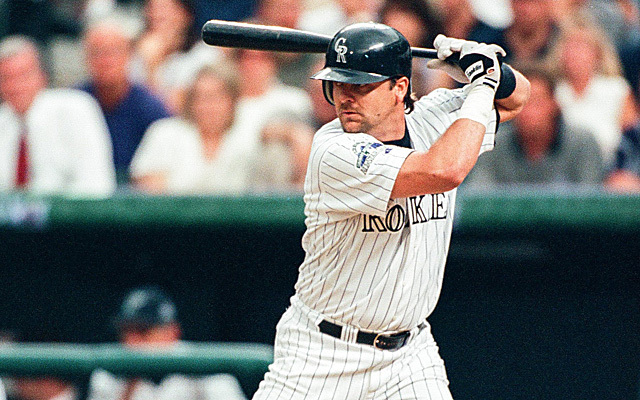 Larry Walker - Arguably the best baseball player to ever play for the Colorado Rockies, Larry Walker was a Hall of Fame talent who struggled through injuries during his shortened career. When he was healthy, Walker was CarGo before CarGo was CarGo. A smooth left-handed swing, one of the strongest arms in the game, dangerous on the base paths, speed in the outfield, power to both sides of the field, and a great batting eye. He was the NL MVP in 1997, a consistent Gold Glove and Silver Slugger recipient, one of the most talented players of his generation, the greatest Canadian baseball player ever, yet he is receiving little support to enter Cooperstown. The reason is longevity. Taking out his September call up in 1989, Walker only averaged around 123 games played per year. Doing the super complicated math, Walker missed an average of 39 games due to injury or fatigue. Missing nearly a quarter of your season every year is not the best way to pad your stats or make your case for the Hall of Fame. When Walker signed as a free agent with the Rockies, he was a 28 year old star solidifying the Blake Street Bombers as one of the most dangerous lineups in baseball. His introduction to the city came at a time when the Rockies were still a new commodity and Denver was crazy for baseball. His years in Colorado, teamed with Galarraga, Castilla, Bichette (Happens), Burks, EY, (high school baseball coach turned MLB manager) Weiss, Wilson, Helton, and a bunch of other Todds, resulted in offensive numbers near the top of the league. And Walker was the best of the those teams. I loved watching him play, I loved watching him hit, I loved his love of Patrick Roy and the number 33. And how could you not love this? 4. Randy Johnson - Well that segue was easy. . . 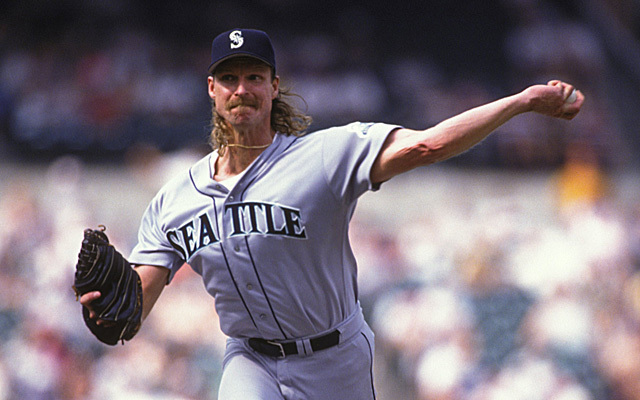 When it comes to pitchers, no one was as intimidating as the Big Unit. Standing on the mound at six feet ten inches with that amazing mullet and a permanent scowl etched on his face, stepping into the box against Johnson might be the scariest scenario that you can find in baseball. The combination of Johnson's stature and his repertoire of dominant pitches made him one of the greatest pitchers to ever play the game. 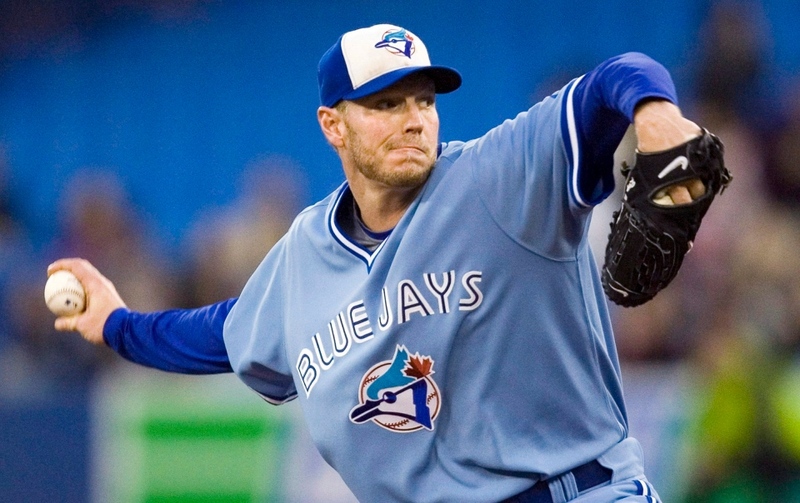 Over his 22 year career, Johnson collected five Cy Young awards (1 in Seattle, 4 in Arizona) and finished second in votes in three additional seasons. Johnson's stats further solidify his unreal talent. He ended his career averaging 10.6 strikeouts per nine innings. That is an absurdly high number until you realize that he amassed a total of 4,875 strikeout over his career. While playing his first season with the Arizona Diamondbacks, Johnson pitched 12 complete games THAT SEASON. That year was the third time that he had pitched 10 or more complete games in a single season. (By comparison, the Rockies only average 4.7 complete games per season as a team and only have reached double digit complete games once.) The dude was a workhorse as well. He reached 200+ innings in 14 of his 22 years playing. I loved watching Johnson pitch. His delivery used every inch of his giant frame and every last ounce of his perceived internal rage to overpower hitter after hitter after hitter. And if you hate birds, Randy is your guy. 3. Ken Griffey, Jr. - If you were born before 1985, your list of top ten all-time favorite baseball players includes The Kid. This is not my personal opinion. This is fact. Griffey is the son of a professional baseball player who got to the big league so quickly that he was a teammate of his father for a season and a half (which might be one of the coolest things to ever happen in MLB history). His rise was not the result of a ride on daddy's coattails but through his superhuman natural talents. Griffey could and would do anything. He made acrobatic catches in the outfield, made more acrobatic catches in the outfield, robbed batters of home runs, threw out runners with his cannon, hit back-to-back home runs with his pops, and was cooler than you and me combined. And I have not touched on the most amazing part about Ken Griffey, Junior. His swing. Good lord, that swing. A Griffey swing GIF on a loop could entertain me for hours. Scratch that. Days. It is so pretty. When former players start gushing over a swing, you know it is a thing of beauty. But Kirby was not done with his drama. The Braves eventually forced extra innings and the teams battled into the 11th inning. 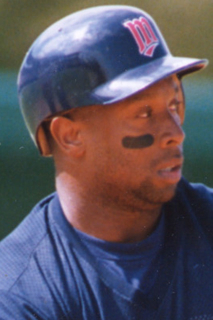 Leading off the bottom of the 11th was Kirby Puckett. The legend of the Puck had its capstone moment. The Twins would go on to win the World Series with an outstanding Game 7 pitching performance by Jack Morris (10 inning complete game shutout). But it was Kirby Puckett who solidified his position on the apex of the Minnesota sports scene. No one -- not the native son Joe Mauer, not Kevin Garnett, not Adrian Peterson or Cris Carter -- has come close to supplanting Kirby at the top. On a personal level, Kirby is more than just ball player. My grandfather played semi-pro ball around Wisconsin for a long time before I was born. From the stories that I have heard of his playing days, my grandfather played like Kirby Puckett. He was short in stature, shaped like a barrel, deceptively fast, full of energy, and always wearing a smile. Watching Kirby play the game gave me a glimpse of what it may have been like to watch my grandpa play ball. 1. Todd Helton - While Kirby wins the nostalgia points for being my baseball hero during my formative and youthful years, Todd Helton has been my baseball hero during adulthood. Todd played during a time of my life when I could watch so much baseball (and I did). The Toddfather came up with the Rockies in 1997, as I was transitioning from middle school to the grandeur of high school. That summer, I watched Rockies game after Rockies game on KWGN Channel 2. A late season call-up, Helton played his first game with the senior squad on August 2, 1997 in a game against the Pittsburgh Pirates. In the fourth inning, Helton got his first base hit. In the eighth inning, he hit his first home run. I was smitten. In the 17 seasons of his career, number 17 assumed so many roles on the team. He was the young slugger added to the final run of the Blake Street Bombers. He was the senior statesman during Todd and the Toddlers. With the exception of a few back issues, the Rockies' lineup card included #17 batting second or third, playing first base, and setting franchise records for nearly every category. Perusing the Rockies leader page on Baseball Reference reveals the extent of Helton's greatness. Every offensive category has Todd Helton at or near the top. Helton is first in games and at-bats, nearly doubling Larry Walker's and Vinny Castilla's second-place rankings. He is first in runs, hits, doubles, home runs, runs batted in, walks, intentional walks, sacrifice flies, total bases, pitches seen, plate appearances. Helton's game was one of meticulous attention to detail on both sides of the ball. A classic Helton at-bat involved pitch after pitch being fouled off to get to one he wanted. He was mentally prepared to go to battle against the opposing pitchers, seemingly knowing what pitch was coming before the windup began. In the field, Helton was a ball magnet at first base. His glove could scoop up any errant throw from an infielder. Knowing that Helton was at first allowed the other infielders to confidently unleash off-balance throws in the vicinity of the bag. His presence helped the Rockies become one of the premier defensive infields in baseball. The stats tell the baseball side of the story, but Helton is not on the top of this list because he could hit the ball well and had a great glove. While I have already covered my love for Helton in a previous post shortly after he retired, one specific moment in his career perfectly explains why I feel the way I do - the Saito homer. Helton's dinger came against a guy who had been dominant that season, completed a sweep of the hated Dodgers, and was in the middle of the historic 21 of 22 run that bridged the 2007 regular season and the 2007 postseason. The normally robotic Helton yelled, pumped his fist, threw his helmet, and jumped into the dog pile at home plate. 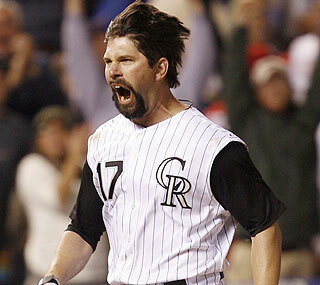 That moment was so big, even Todd Helton could not contain his excitement. The greatest player in the history of my favorite team deservedly takes the number one spot in my personal rankings.